Carretera del Morro. km 7 1/2. Santiago de Cuba. 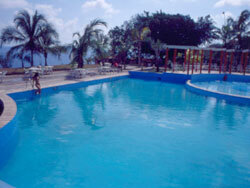 Hotel Balcon del Caribe stands at the entrance to Santiago de Cuba Bay and just 7 kilometers from the city center. It enjoys the countryside; a rustic landscape of astonishing beauty close to the World Heritage Site of San Pedro de la Roca del Morro Fortress. From its rooms you can admire an expansive view of the Caribbean Sea as it welcomes visitors. Lively shows at the San Pedro del Mar Cabaret and easy access to many historical-cultural sites in the city complete the Hotel’s recreational options. 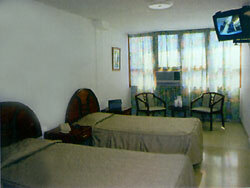 94 air-conditioned double-rooms with private bath, satellite TV, radio, and telephone. 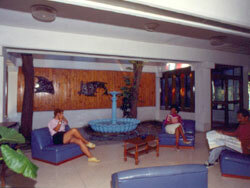 Others: restaurant, cafeteria, bar, snack bar, grill, night club, swimming pool, shop, central safe, currency exchange and parking. No reviews for Hotel Balcon del Caribe yet.